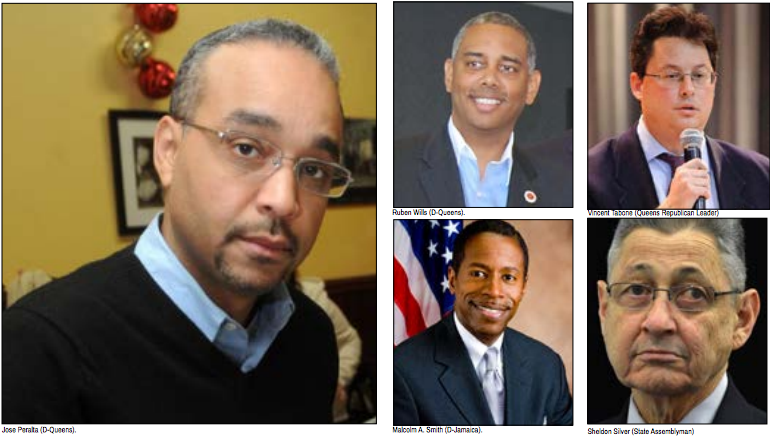 Dan Holloran (R-Queens), Ruben Wills (D-Queens), Vincent Tabone (Queens Republican Leader), Malcolm A. Smith (D-Jamaica), Sheldon Silver (State Assemblyman) are all among the NYC political leaders under scrutiny for crime committed while in office. A few political leaders of New York State have been under a microscope for committing some type of crime while in office. Assemblyman Sheldon Silver, former Councilman Ruben Wills (D-Jamaica), former Senator Jose Peralta (D-Queens), former Senator Malcolm Smith (D-Jamaica) and former Queens Republican leader Vincent Tabone are those politicians who have been in the news as of most recently for their crimes. Smith was convicted, on Feb. 5, of attempting to bribe his way onto the Republican ballot in 2013 during the New York City mayoral race. He was found guilty, in a federal court in White Plains, N.Y, on all counts including bribery, conspiracy, wire fraud and extortion, according to the Wall Street Journal (WSJ). Smith worked with Vincent Tabone, a former Republican party official, who was also convicted of the same charges including the obstruction of justice. Both men are looking at up to 50 years beginning July 1. Daniel Halloran, a Republican city council member was also a part of the bribe as he helped to negotiate the deals. According to the WSJ, there was about $130,000 exchanged in private hotels and parking lots. The first trial for Smith and Tabone ended in a mistrial in June and after days of testimony, a federal agent revealed the existence of 93 hours of recorded phone calls, which were also in Yiddish. There was also evidence of more than 3,100 text messages from a government cooperating witness. Bribery seems to be the common crime that former New York Assemblyman Sheldon Silver has also indulged in. He exploited his position by lying about earning an outside income by being a personal injury lawyer who represented ordinary people, according to The New York Times. This was a cover-up to mask the $4 million he obtained in payoffs. His arrest was announced on Jan. 22. Silver “was accused of steering real estate developers to a law firm that paid him kickbacks. He was also accused of funneling state grants to a doctor who referred asbestos claims to a second law firm that employed Mr. Silver and paid him fees for referring clients,” according to The New York Times. The criminal complaint runs to 35 pages and explains in detail what Silver was up to. It has charged Silver with honest services mail and wire fraud, conspiracy to commit honest services mail fraud, extortion “under the color of law” — using his official position to commit extortion and extortion conspiracy. On Feb. 19, a federal grand jury in Manhattan voted to indict Silver on the fraud and extortion charges that were the basis of his arrest. And he resigned after he originally said he would retain his position with Democratic members of the Assembly standing behind him. Assemblyman Carl E. Heastie, a Bronx Democratic, was selected to replace Silver. Next on the list is Ruben Wills, a Democratic councilman. He was arrested May 7, 2014 with a relative of his for being accused of using a charity, which he founded in 2006 for single moms called New York 4 Life, as a fund for personal expenses. As per the charity, Wills received $33,000 in state funding and after spending $14,000 to organize a program for the charity, he used $19,000 for personal shopping trips to Nordstrom and Century 21, according to DNAinfo. Wills used a relative’s company to steal more than $11,000 in matching city campaign funds. Altogether, prosecutors determined that Wills stole a total $30,500 from the city and state. Wills was charged with fraud and grand larceny. Jose Peralta, the first Dominican-American elected to the State Senate had been revealed, in May of 2013, as one of the elected officials recorded by a legislator who sought out leniency from prosecutors after it was confirmed that she had been confronted with evidence of corruption, according to The New York Times. At the time, he had been running for borough president of Queens, but the Queens County Democratic Party passed him over and endorsed another candidate. While this has been a rough few years for our political leaders, the swift actions taken to solve the corruption proves that things are looking better for our future leaders.